The Bullmastiff and the English Mastiff are popular breeds under nearly the same lineage. However, despite their noticeable similarities, they bear a lot of differences. This article draws the line between these two breeds. Standard colors are fawn, red, and brindle Standard colors are fawn, brindle, and apricot. The Bullmastiff, as the name implies, is a crossbreed between the Bulldog and the Mastiff. Developed in England in the 1800’s, the Bullmastiff is a large dog breed distinct for its short muzzle and muscular built. It shares characteristics with molosser dogs, which are large dog breeds that come from the same lineage. Meanwhile, the English Mastiff, often known as simply Mastiff, is an extremely large dog breed characterized by its large head and build. Known as a ferocious war dog in the early 1800’s, the English Mastiff is a friendly and warm companion. The difference between a Bullmastiff and an English Mastiff goes beyond what meets the eye as they display varying characteristics. The English Mastiff is a purebreed that descended from the Pugnaces Britanniae and Aluant back in the 19th Century. The Bullmastiff, on the other hand, is a crossbreed between a Bulldog and a Mastiff. It was first bred in England in the mid-1800’s in an attempt to develop a large dog breed that possesses strength, speed, and agility. The English Mastiff is bigger and heavier, with its weight and height reaching up to 220 pounds and 2 feet and 8 inches, respectively. Meanwhile, the Bullmastiff weighs approximately 130 pounds and stands 2 feet and 3 inches tall. The English Mastiff is an extremely large dog breed that has an enormous head and body built. It is most distinct for its black mask, which covers the area around its eyes, ears, nose, and muzzle. It is found in a limited number of colors, including fawn, brindle, and apricot. The Bullmastiff displays physical traits similar to the English Mastiff, but it is smaller and has a shorter muzzle, making it more susceptible to overheating and breathing problems. The colors of the Bullmastiff include fawn, red and brindle. The Bullmastiff is less sociable and tolerant of other household pets and animals than the English Mastiff. Both breeds need to participate in regular walks and outdoor activities to promote a healthy lifestyle. 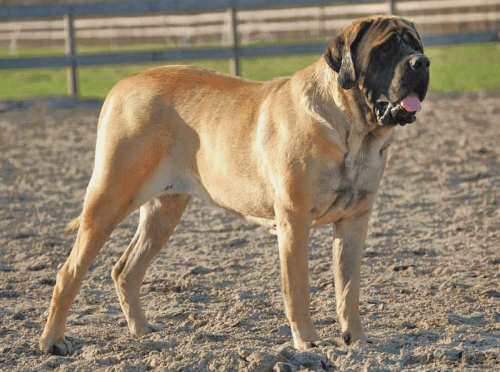 However, between the two, the English Mastiff requires more exercise because its size makes it more vulnerable to weight-related health conditions such as hip dysplasia. The food requirement of every dog breed is highly dependent on factors like age, size, metabolism and build. Since the English Mastiff is larger than the Bullmastiff, it requires a larger portion of food, reaching around 6 to 8 cups per day. The recommended daily serving for a Bullmastiff, on the other hand, ranges between 3 1/8 to 4 1/8 cups a day.